The Southern Region supplies much of the nation’s bait and feeder fish. Annual retail sales of baitfish alone in North America have been estimated at $1 billion. Nearly all southern states report some baitfish production, but the bulk of the industry is in Arkansas. Arkansas bait and feeder fish producers farmed almost 28,000 acres of production ponds and recorded farm-gate sales in excess of $51 million in 1997. Feeder goldfish alone are the #2 FedEx product shipped from Arkansas. The three main species raised for bait are the golden shiner, the fathead minnow (both the normal colored and rosy red varieties) and the goldfish. 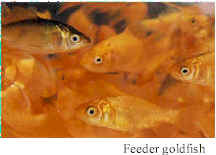 Golden shiners and goldfish spawn on fiber mats, and the eggs are transferred to other ponds for incubation and grow-out. A current trend is towards indoor spawning of broodfish and tank hatching of eggs. Fish are harvested from ponds throughout the year, held in tanks for purging and grading, then sent to market by livehaul truck or in plastic-lined shipping boxes. Producing baitfish is expensive. Fixed costs alone in golden shiner production exceed $1.00/lb, and labor requirements are greater than for other pond-raised species, such as channel catfish. The bait and feeder fish industry is highly competitive, and marketing is a major challenge for producers. (Text and photos courtesyNathan Stone, Arkansas Cooperative Extension Service, UAPB).